This tocopherol-rich organic bioactive Vitamin E shampoo directly hydrates the fibres of the hair while restoring the natural moisture levels of the scalp. Combined with organic Aloe Vera, this super hydrating formulation leaves the hair full bodied, vibrant and shining with health. Massage shampoo into wet hair. Rinse and repeat as necessary. 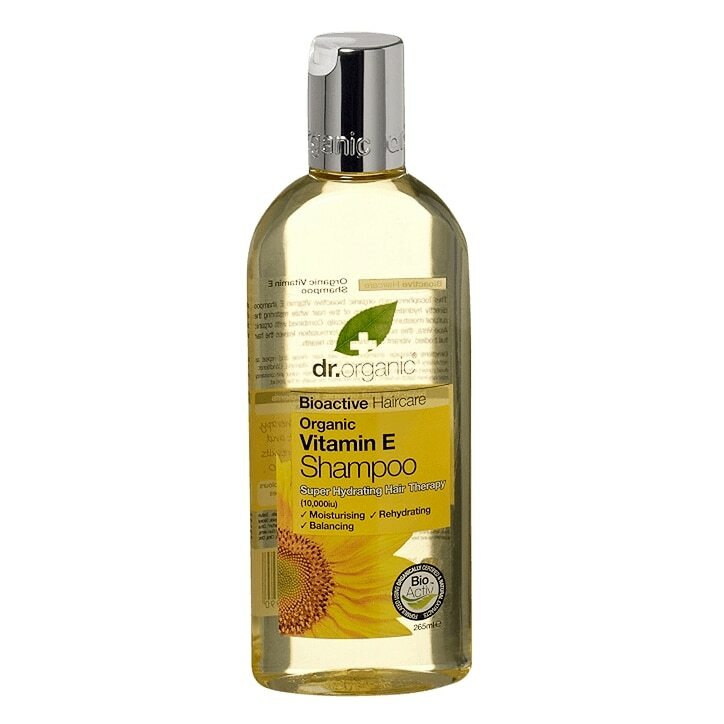 For best results follow with Dr Organic Vitamin E Conditioner. Aloe barbadensis leaf juice, Aqua, Sodium lauroyl sarcosinate, Sodium cocoamphoacetate, Cocamidopropyl betaine, Palmitamidopropyltrimonium chloride, Coco glucoside, Glyceryl oleate, Sorbitan sesquicaprylate, Sodium hydroxymethylglycinate, Caprylyl/Capryl glucoside, Parfum, Citrus medica limonum (Lemon) peel oil, Cymbopogon citratus (Lemongrass) oil, Canarium luzonicum (Gum elemi), Oryza sativa (Rice) bran oil, Tocopheryl acetate, Benzyl benzoate, Limonene, Benzyl salicylate, Citral. Dr Organic Vitamin E Shampoo is rated 4.5 out of 5 by 35. Rated 1 out of 5 by Bellebadondis from Frizzy Dry and Limp I have been a professional hairstylist for 18 years, even taking part in a TV documentary about shampoo and conditioners. As you can imagine, i have tried a LOT of various makes of shampoo & conditioner. I purchased Dr Organic shampoo and conditioner a month ago. Out of all the different varieties of shampoo and conditioner I have used over the years, this by far is the worst. If this label was covered up and I were given this product to try, I would think it was a low end budget shampoo and conditioner. Just so your all aware, I have fine delicate hair. After using Dr organic Vitamin E shampoo and conditioner my hair was left limp, static, frizzy and tangled to the point I was unable to even blow dry it. I would most definitely not be using this product again or recommending it. I have a feeling that this is sold for a reasonable price but contains cheap ingredients. My advise, steer clear. I could actually do a YouTube video to show you all the state of my hair after this product, you would clearly see for yourself. Rated 5 out of 5 by Happy77 from great product I am very happy with it, my hair is healthier now. Rated 2 out of 5 by Von62 from Dissapointed I have been using this shampoo and conditioner for about a year and have loved it. Have just received my recent order of more and don't know what has happened to the shampoo! Used to really larther well...now nothing?? Don't know if they have changed the ingredients but now have to use loads to wash my hair and I have short hair. Also my scalp has started to itch? So dissapointed. Rated 5 out of 5 by swanleynic65 from Top notch I've been using this shampoo for a few years now and really love it. My hair's condition has greatly improved. Rated 5 out of 5 by Yelrahc060606 from I've never dyed my hair or anything and it suddenly started to dry out and break, and fall out. At first I thought it was something to do with how long my hair was I spoke to a hair dresser and was advised to use an organic shampoo with no SLS in it and I came across this. I've used it 3 times and my hair is so soft and healthy looking and the hairs stopped falling out I've ordered another two bottles it's a life saver my hair looks amazing I'll never use any other shampoo. Rated 5 out of 5 by Shirolight from Very good! This shampoo has a pleasant mild, natural, leafy smell to it. This is the first organic, sulphate-free, etc. shampoo that I've ever tried and I am quite pleased. It is refreshing to know that my hair is not receiving any harsh chemicals and such when using this shampoo, but instead is receiving quality ingredients. This shampoo works up a nice lather with a small amount, and effectively removes dirt and grease from your hair. Rated 5 out of 5 by Suzy17 from Super Vitamin E Shampoo I'd was running out of the Dr O's Coconut Shampoo and decided to give this one a try as I found the coconut one was making my roots a little too oily & I found it didn't really foam up. I'm glad I found the Vitamin E Shampoo - it foams great - my hair is starting looking nice & healthy again after 4/5 washes. I find there isn't much of a fragrance to these shampoo's but that doesn't bother me much. Will be purchasing again - as I've been searching for a shampoo for a while that has no harsh chemicals.